147.135 + offset 127.3 Located in West Monroe, La. The 135 is a Motorola MSF5000 repeater with a CAT 1000 Controller. It is currently in the Western portion of West Monroe. The antenna is a DB-224 about 200 feet AGL fed with 1/2″ Heliax. This Repeater will move to a new tower at about 480 feet once it is finished construction. (DMR) Color code is 3 Linked into the Brandmeister Network. TS-1 is statically fixed to All-Louisiana TG 3122 TS-2 is dynamic. 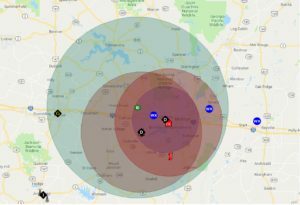 LDRC Currently has ownership of 3 APRS Sites… the W5KGT-1 Digi is located in Calhoun Louisiana up about 100′ the Radio is a Motorola GM300, the KC5DR-1 is an iGate up about 35′ AGL located in West Monroe. Total coverage includes the I-20 corridor from just west of Ruston to just East of Monroe. W5KGT Portable Tower. This system incorporates a 100′ tower, a 70cm and 2m repeater, hf antennas and other equipment for linking and APRS. This tower isn’t owned by the club, however; we have invested a substantial amount in the equipment.